Georgia Occupational Therapy Gainesville GA | Speech Therapist ATL, Gwinnett | TSG Inc. Therapy Solutions of Georgia, Inc. (TSG) assists clients in attaining their maximum potential for developmental growth through quality speech-language and occupational therapy. At TSG, we focus our efforts on tailoring specific therapy services to meet the unique needs of each individual patient. As a result, our patients are able to meet their goals more quickly and most importantly, maintain a consistent level of performance. TSG was founded in 2002 by Kelly and Chris Ball, but the idea for the agency was born much earlier. A certified speech therapist with a master's degree in Speech-Language Pathology, Kelly's background includes positions in a variety of environments including private practice, an early intervention center, and the public school system. When she and Chris made their way back to Georgia from Alaska in 2001, Kelly began working for a community hospital. She soon found the overwhelming administrative duties shifting the focus away from her patients. It was time for a change. Determined to find a way to provide the quality services she believed her patients deserved, Kelly decided to establish a pediatric therapy company of her own. A business consultant with a local CPA firm at the time, Chris lent his business knowledge to help his wife establish the company and TSG was officially founded. Together, they started building an organization that would allow therapists to focus on what's most important — their patients. 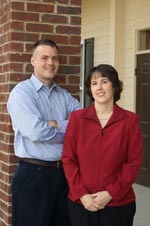 In October of 2003, the first therapist joined the company. In the spring of 2004, TSG moved its then home-based operation to a physical clinic located in Dacula, Georgia and opened a second location in Athens, Georgia in April 2008. TSG now employs a team of therapists to serve the ever growing pediatric population of the surrounding area. An unwavering commitment to excellence established TSG as an industry leader early on, and we continue to raise the bar by providing an enriched environment for both our patients and our employees. Our patients receive a plan of care individually developed for their specific needs. Our services are delivered on a consistent basis thus allowing for goals to be effectively targeted. Our therapists are encouraged to meet their professional goals and are supported in those efforts. Administrative duties are managed by dedicated personnel enabling our therapists to focus their full attention on treating patients. As a result, patients receive the best care available in a timely manner and our therapists are rewarded by their patients' accomplishments. At TSG our primary goal has always been to exceed our patient's expectations, and we continue to do everything in our power to make that happen. As our organization continues to grow, our primary goal will remain the same; to help children overcome their developmental challenges and meet their full potential — one patient at a time. Occupational and Speech therapy Gwinnett County - Licensed therapists providing speech and occupational therapy near Gwinnett, Buford, Dacula, Suwanee, Atlanta and the surrounding area. If you have any questions, feel free to contact us.